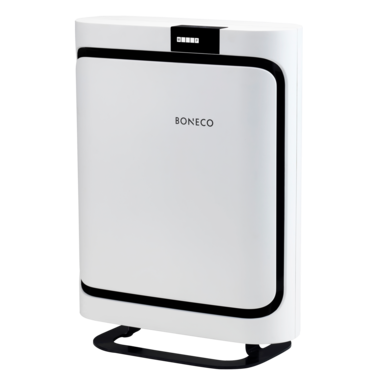 The P400 Air Purifier gives you highly efficient air purification at home. Insert the filter that meets your needs: ALLERGY (standard equipment), BABY or SMOG. Whether at home or at the office: From a product family with an award-winning design language, the P400 will blend in effortlessly with your everyday surroundings – its quiet operation will never distract you. Enjoy fresh mountain air in every room. Are you familiar with the satisfying feeling when you go for a walk and can breathe easily after a thunderstorm? Nature shows us the way. At home, it's our HYBRID which regulates the beneficial air quality. Living rooms are often highly polluted due to a high concentration of allergens. The cleaned room air feels as if you are in the mountains breathing in clean air. Developed for you, the filter packages which include a HEPA filter reduces 99% of the allergens in the air. DIMENSIONS (LXWXH)224 × 420 × 562 mm | 8.8 × 16.5 × 22.1 in.